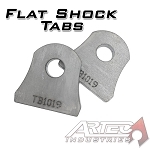 Set of 2 Shock Mounts Boxed, these mounts are CNC cut from 1/4" steel plate, precision bent, tumble finished, and ready to be welded in. Like our other boxed shock mounts, using these is as easy as it gets! 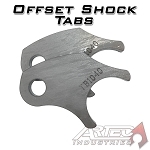 These mounts are designed to be welded directly to your axle or any flat surface (as you will notice in the picture, the two opposing sides are flat and the third side is cut on a radius to fit any axle), and are three times as stiff as using two separate tabs. 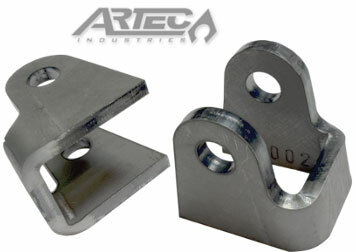 Available in either 1 1/4" or 1 1/2" mounting widths. Inquire about other sizes and styles, on our Contact us page! nice cuts, looks good, but didn't fit my application, the opening for the shock is only 1 1/4", I needed 1 1/2" for my shocks. These mounts are awesome! Great quality at a great price and heavy duty too! 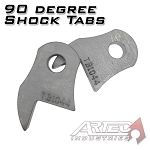 I am using these on a hot rod and were a perfect fit for my coil over mounts. Very strong and we'll made product! They fit perfectly and have held up very well. Very beefy and well made! Mounts are of good design and quality. Work well for my application. Excellent price. Q: What is the hole size and mounting height for this bracket? A: The hole size is 1/2" , The mounting height to center of bolt hole is 1.5"
A: Yes, They are sold in pairs .